The recipe at "Less is More" this week is to include a tag on your creation. with alcohol pens and twinkled with Glamour Dust. A larger tag here with a super butterfly from Indigo Blu. It stamps very well with Distress Ink. Here I used Tumbled Glass and Mermaid Lagoon. The splats are from Paper Artsy and Stampin' Up and the sentiment from Penny Black! The ribbon just happened to match perfectly, , otherwise I would have coloured some with the Distress Ink! Perfect! Two stunning cards, the butterfly is right up my street - love it! Gorgeous as always Chrissie. Love the bunny card too but your LiM DT card is awesome. Love it. Enjoy the weekend. Love these cards, Chrissie! The ME bunny is so sweet. The butterfly card is amazing. Love it! You must have been in a "blue" mood, Chrissie. ;) The colors are lovely on both cards. Such a cute little bunny and I always love some splatters. Both cards are perfect and elegant. But I can't stop admiring the blue butterfly. Amazing. 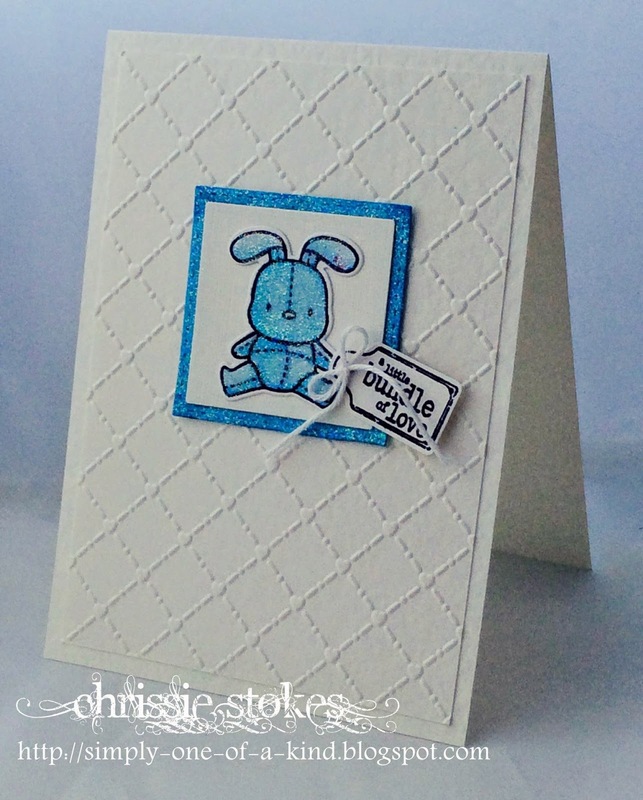 Two gorgeous creations as ever - that LOTV tag is a perfect proportion for your bunny isn't it! I would like to thank you for your sweet comment on my blog about writing my posts in 2 languages. Thank you for the nice compliment and for your comment on my card too ofcourse. Wonderful shades of blue on the butterfly card. The baby card is cute and a great idea. Nuts! I think I hit a button that removed my comment before it registered. I just said how much I love the result of your method used for coloring the butterfly and the splats are great, too. The blues in both these cards are gorgeous. The background on the baby card really works well with the framed image. These are awesome! I really love the second card with the blue splats, beautiful! 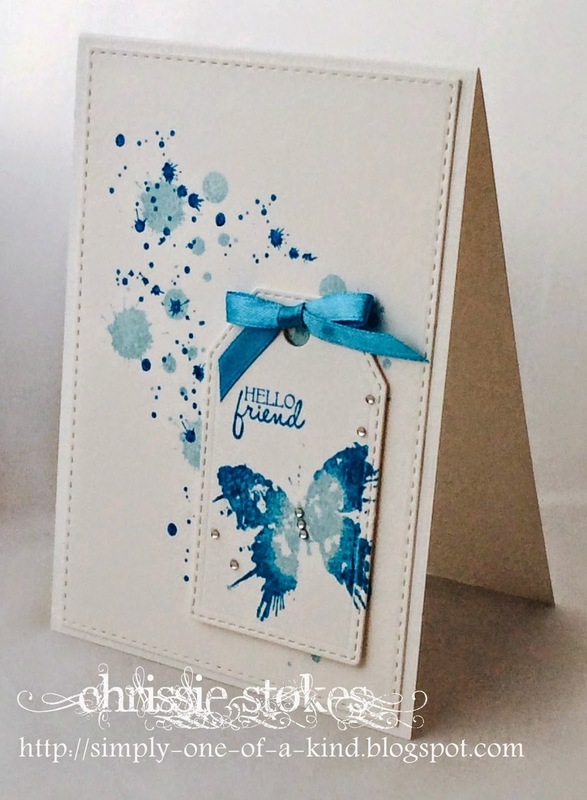 Love your blue splatters - they go so well with the butterfly - and you reminded me to emboss my backgrounds to give that extra interest! Two lovely cards Chrissie - the splattered butterfly is so full of movement and the bunny oh so cute! I love both of your cards! That first one is darling, and I love artsy look of the second one. TFS.